Help! Where did my contractor go? One of the biggest fears many people have about hiring a contractor is whether the contractor is going to hold true to their commitments. Will the contractor start the project on time? Will the contractor have unexplained absences? Will the contractor do what they said they were going to do? Will the contractor finish on time? You are right to have these concerns. Hiring a contractor for a custom project is, by its nature, untested since every project is different. There are so many factors that determine how long the project will take, if it will be built as promised, and if it will start and finish on time. As we’ve mentioned in past posts, reading as many reviews as possible is a great way to get a sense of the degree to which the contractor fulfills their commitments. Here is another recent post we did about selecting a contractor. What is the gold standard for start date, continuous work flow and finish date? Here is the simple answer to this question. The gold standard is that the contractor does what they say they’re going to do. Contractors will have various factors that determine when they can start a project, how long a project will take and if they will work continuously after the beginning of the project. Our standard is once we start a project, we will work continuously on that project until it’s complete. We will be there every day. You can count on it. The only thing that will keep us from being there is weather that prohibits us from building and if by some chance an item is back-ordered. There are two primary factors that influence why some contractors do not deliver on a continuous work flow once your project begins. First, there are ethical factors and secondly there are organization factors. A less than ethical contractor may make commitments to several homeowners for the same timeline. They may do this because they fear losing your business if they are honest with you about when they can start or finish your project. In order to juggle multiple jobs with the same timeline, this contractor may provide various excuses such as waiting for inspectors, sick staff, flat tire, broken-down vehicles, etc. An disorganized contractor may not be able to hire and retain quality staff, maybe frequently because they don’t treat them ethically and legally.High quality skilled people like to work for a high-quality organized company. Many small businesses or contractors don’t have the the business experience or management skills to retain skilled staff. The disorganized contractor may not be skilled at planning project schedules. And, they may have a poor system for tracking materials or ordering on time causing them to run out of key materials necessary to achieve continuous work flow. 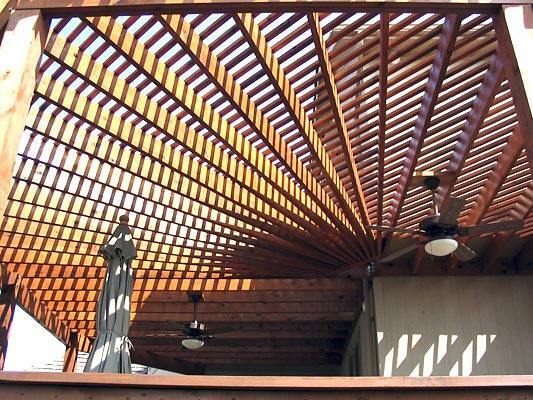 When we start your project at Archadeck of Kansas City, we guarantee that we are going to be there every day unless a product is back ordered or unless the weather absolutely prohibits us from building on that day. 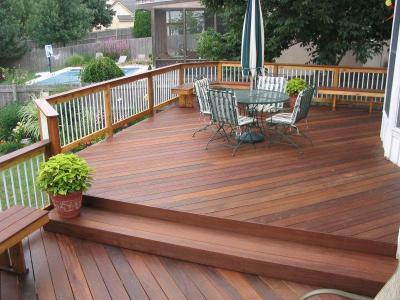 Call us for a free consultation (913) 851 – 3325 or email kansascity@archadeck.net. We look forward to talking to you about your project. This entry was posted in Choosing a contractor, Project management, Selecting a contractor on February 28, 2012 by archadeckkansascity. I often get asked about a deck we built a few years ago. It is the one featured in the blog header. 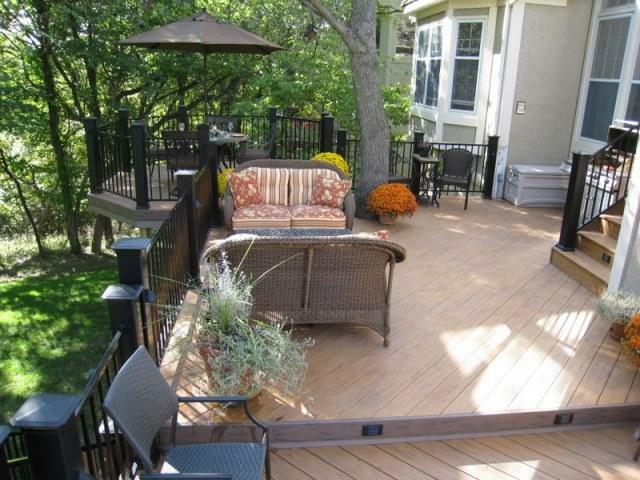 We constructed this deck in Parkville, MO for homeowners that were looking to expand their livable space. When considering any type of outdoor structure it is important to look at the use of the structure from a practicality standpoint. For example, what will the structure be used for? Do you want to eat or entertain outside? Once you decided what function the structure will serve , we can then design and build a structure that best suits your needs. 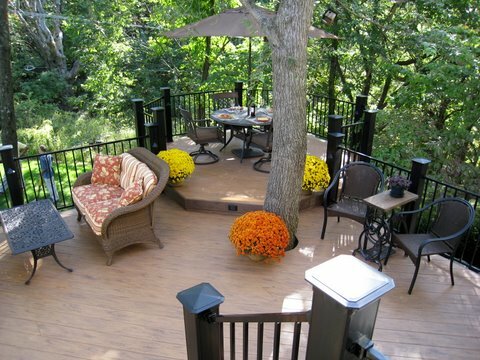 One of the interesting things you will note is the way this deck works around the existing tree. It was important to the homeowners to either work around the tree or integrate the tree into the design. We expanded the size and changed the shape of the deck area. 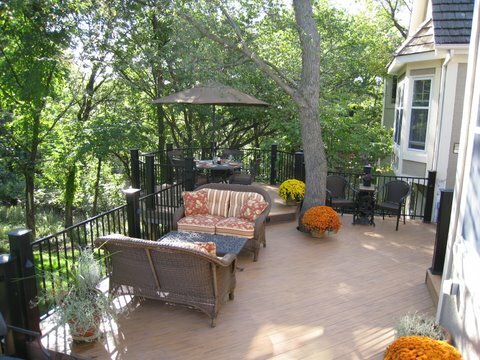 This redesigned area gave the homeowners more space and accommodated the tree into the new deck design. We used TimberTech Earthwoods composite flooring in Pacific Teak. Along with the TimberTech flooring we used a TimberTech radiance rail posts and added lights onto the rail post themselves. On the railing we used Fortress steel railing. Composites such as TimberTech are not only aesthetically appealing they are durable and require little maintenance. 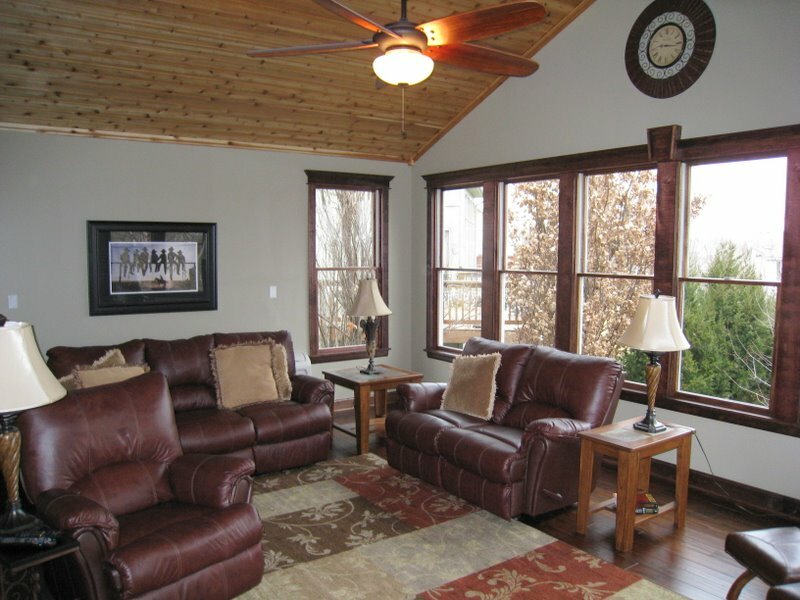 TimberTech Earthwoods has the natural look and feel of real wood. 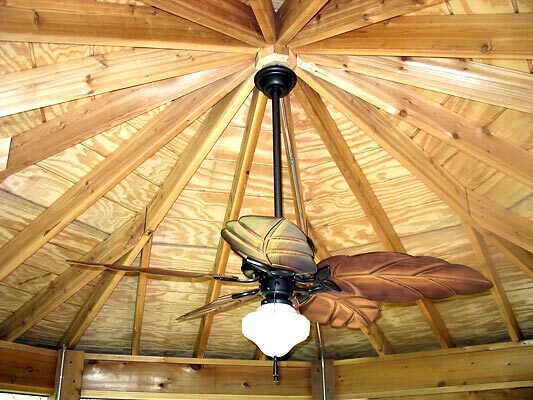 It never requires any staining or sealing. 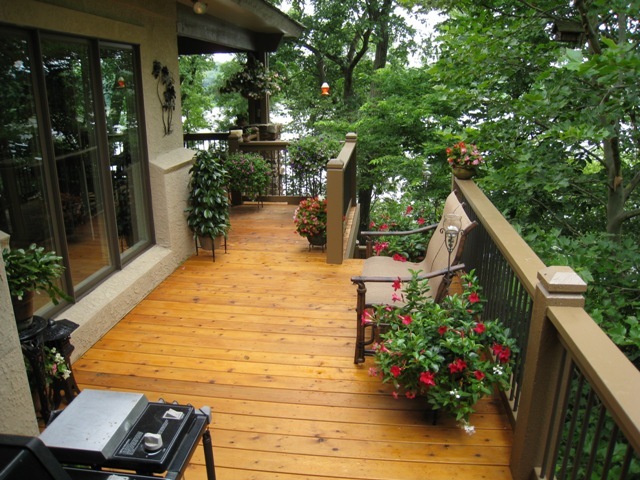 This decking composite is virtually impervious to weather and any everyday accidents that can occur with most decks. Hidden fasteners accentuate the clean lines and appearance of this composite as well. 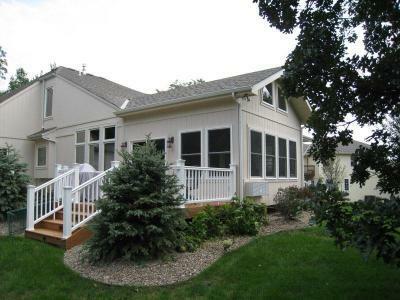 The finished area holds approximately 400-500 square feet of usable space within this deck. Since the elevation of the yard slopes from about 3 feet to 8 feet Archadeck of Kansas City added a step down to gain entry and to exit the new deck. 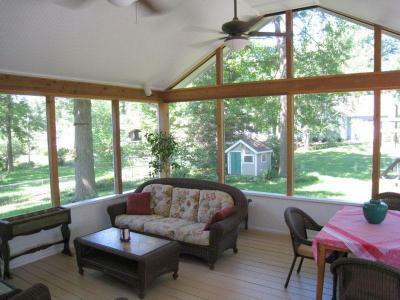 The homeowners came away from the project feeling very fulfilled with the beauty and addition of space the new deck provided. They even purchased a new suite of outdoor furniture for the new deck, which only accentuated its beauty. 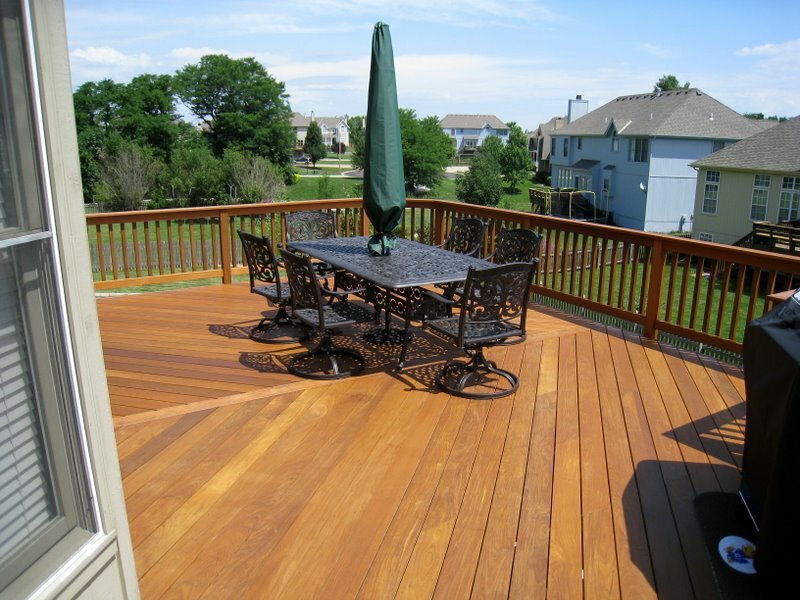 This entry was posted in Choosing a contractor, Composite decking, Composite decks, Composite woods, Decks, Fortress iron railing, low maintenance decks, Low maintenance railings, Railings, TimberTech and tagged Archadeck KC, Archadeck of Kansas City, Composite decking in Parkville MO, Custom decks, Deck builder Kansas City, Deck builder Parkville MO, Decks, Fortress iron railing Kansas City, Kansas City decks, low maintenance decks, Timbertech deck in Parkville MO, TimberTech Earthwood Evolutions, TimberTech Earthwood Evolutions Kansas City, TimberTech Earthwoods decking Parkville MO, TimberTech Radiance Rail on July 11, 2011 by archadeckkansascity. You’ve probably heard the old saying ” believe half of what you see and none of what you hear”. These words may ring true today more than ever. With the internet, smart phones and all the advanced technology of today we are all receiving information on the “best this” and “worst that”. In this world of information overload, how do you know what information you find online is trustworthy and what information is not? Whether you’re looking for a contractor or a consumer product, one rule of thumb is a company whose brand name means something in the offline world will most certainly have the same standards in their online world or their online presence. Two referral sources do stand out a little when looking for integrity and reliability when choosing a contractor or even a maid to clean your home. These two forces are the BBB (Better Business Bureau) and Angie’s List. Both the BBB and Angie’s list strive to provide reliable information from a recognized brand that represents integrity. Both sites give us the ability to research in earnest and unbiased terms the quality of work and service of a prospective company. These two companies work in much the same manner by using information provided by the consumer to allow prospective clients to make informed decisions through the feedback and grading systems of each to find the best company or business to suit their needs. Let’s say for example you are looking for a painter to paint your home. Angie’s list is set up to be consumer friendly. For a nominal yearly fee, you as a consumer would have access to all the painters in your area that are on Angie’s list. A business cannot pay to be on Angie’s list. Businesses register on the list for free and consumer’s submit reports and reviews of their experiences with each business. This method gives the consumer a “hands-on” experience summary of other consumers which have dealt with that business. This information can help you decide based on what you learn about the business you are considering on Angie’s list. The list reports the honest truth based on what consumers have to say. The BBB also uses positive and negative feedback from consumers to grade each company. Currently businesses are graded using an A+ through an F letter grade, which replaces their previous satisfactory or unsatisfactory ratings system. BBB accreditation is an honor earned by businesses and charities. They use a formula of 8 principles that summarize elements to create and maintain trust in business. They are build trust, advertise honestly, tell the truth, be transparent, honor promises, be responsive, safeguard privacy and embody integrity. If a business or charity has been accredited by the Better Business Bureau then it has met their strict accreditation standards. Both entities are a helpful and trustworthy resource when consumers are looking for help in choosing a company to do business with. These two resources have a wide following and a wonderful reputation in upholding good business practices and helping consumers. The BBB was established in 1912. Angie’s list was founded in 1995, and yes their is a real Angie, she founded the list in 95′ with 1,000 members in Columbus, OH and the list has grown from there. Archadeck of Kansas City is a proud member of both the Better Business Bureau and are on Angie’s list. With the Better Business Bureau, we enjoy an A+ rating. With Angie’s List, we have been awarded the recognition of being in the top 5% of their contractors for the last 3 years. This entry was posted in Choosing a contractor and tagged Archadeck KC, Archadeck of Kansas City on July 11, 2011 by archadeckkansascity. There’s no question that consumers’ perception of value has changed in the wake of the difficult economic conditions over the past few years. But from what I’m seeing, the new “value” doesn’t at all mean the lowest price. The old meaning of value was the best or most product for the lowest price. The new meaning of value is so much more complex. Previous to the recession, consumers seemed to take a lot more at face value. On the products or services side, a widget was a widget. On the price side, the best price was the best price. The tough economic times have taught us that a widget is not just a widget. There are very few products and services that are exactly identical from company to company or brand to brand. When economic times were better, we could afford to overlook these differences that, although often small, could also sometimes be very substantial. The times also have also taught us that the lesser expensive product is not always the best product. For many people, the tough times meant living with a previously more impulsively purchased item for a couple of years longer than originally thought. When this happens, the nuances and subtleties and detailed characteristics of the product both come to light and take on a lot more meaning. Also, our hard-earned dollars have a lot more value to us and we are demanding more value with our purchases. Here’s an example in my line of work. 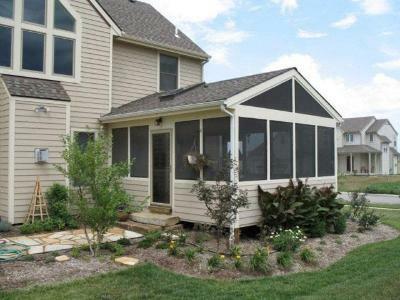 Let’s say you want to build an outdoor living space and you have two quotes – one for $5,000 and another for $6,000. That’s a 20% difference in price. That’s huge. Let’s just say that you really like both contractors. Further, both contractors have great design ideas and both contractors have inspired confidence. Let’s say that in this scenario, you go with the less expensive contractor and you get everything you were hoping and more. You’ve saved $1,000. Then let’s look at the flip side – If the job turns out poorly. You spent $5,000 on an addition to your home and it turns out that you purchased poor quality workmanship that fails the code inspection and you’re left hanging with a punch list that never gets completed, then you have not saved $1,000; you have lost $5,000. Is the more expensive contractor always the best? Sometimes, often, but not always. Is the lesser expensive contractor just as good? Sometimes, but there’s a reason for the old adage – you get what you pay for. So how do you know when looking at quotes from contractors that you are comparing apples to apples? Here are a couple ways to research your contractors and evaluate their proposals to be able to compare apples to apples. First, review their web site. Have the built jobs that are similar to what you are looking for? From looking at their website, have they built many jobs that are similar to what you are looking for? How many jobs have they built? The new value equation is much different. Are your dollars able to produce a return that exceeds your expectations? Look for a value-able contractor by doing the research specified above. kansascity@archadeck.net. Our consultation is always free — something else you should demand. This entry was posted in Choosing a contractor and tagged Archadeck of Kansas City, the changing meaning of value, the new "value" on April 26, 2011 by archadeckkansascity.